From the fullness of one’s heart the mouth speaks, says a proverb in the Holy Bible, a precept repeatedly enunciated in the pulpit by homilists and repeatedly heard in retreats and recollections. This is a dictum that is not simply taken as bible truth, but an experience that cannot be naysaid by human experience. The lips utters what wells from within one’s innermost thoughts and deepest emotion. In the manifold crises that humans encounter day by day, one’s resilience and endurance are put to test. Patience is another virtue that is stretched to its limit. Prudence and determination are likewise weighed in the balance. Though these qualities of a person said to be tough and feisty are determinants in his survival, there is one attribute that should not be discounted, that is his gratefulness. No man is an island, another maxim states. Just as it was in the recent situation in Leyte and Samar islands battered by supertyphoon Yolanda on November 8 last year, the survivors ably stood up and endeavoured to move on as a matter of human instinct in defying death. They struggle to overcome the tribulations that beset them following a worst encounter with nature. Such sweet conquest would not have been possible sans the help of other persons. Here in this turf, international humanitarian groups primarily the United Nations through its commissions and funds, did not waste time to extend help to the survivors, including the government. The UN bodies were adeptly assisted by other private typhoon emergency response groups. 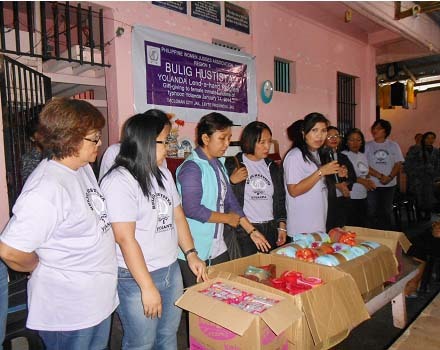 There are those who did their relief operations distinctly, such as the church-based organizations. Cash donations and relief goods flowed where they are and were of course delivered. The contributions of private individuals and civic groups in the country and abroad, in cash or in kind, regardless of quantity are likewise worth a million thanks from those who directly and even indirectly benefitted from these help. Foundations and societies, like the Child Fund International, are also deserving for the effort in conducting psycho-social anti-trauma and stress debriefing sessions on survivors, including children of school age in and out-of-school. Medical teams are equally commendable. Religious institutions, such as the local Roman Catholic Church, which conduct prayer and spiritual counselling sessions with the survivors, are praiseworthy, as well. They supply the most important factor that make a survivor capable of recovering fast – faith in their abilities and trust in their Supreme Creator, God the Father, or any other religious divinity their venerate. Truly, above all these, though, is one unseen heavenly might on whom all good things rest and who deserves the gratitude of an appreciative soul – God Almighty. If there is one being who should be thanked more than any of the persons, institutions and groups who have extended help to the labouring fighter it is God, the Almighty, the ultimate source of all help and strength.